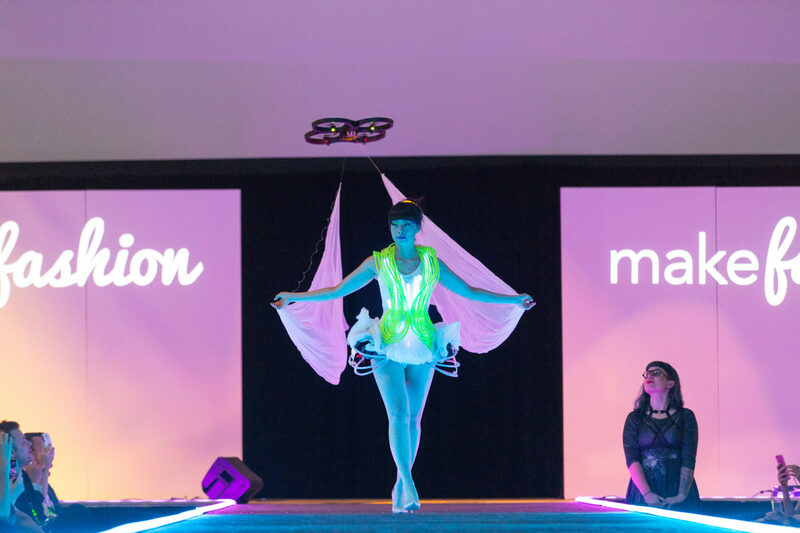 Calgary, Canada is home to the annual MakeFashion Gala and Runway Show, one of the largest of its kind. Launched in June 2012 by a trio of Calgarians, designers and technologists from all over the world meet to show off their latest fashion tech offerings and experiments. There is more to MakeFashion than events; the rest of the year they work hard at designing and developing functional and whimsical wearable tech tools and smartfabrics applications. Their best work also debuts at their annual show every spring. They also encourage and support other communities and makers around the world, with a focus on introducing girls and young women to STEM through fashion. “Don’t like the weather? Just wait five minutes!” is a common expression in places that have rapid weather changes. The 2Hot2Cold team is based in San Francisco, which is famous for micro climates and rapid weather change. 2Hot2Cold debuted a thermally responsive scarf that heats up and cools down based on ambient temperature. This is useful for people who may want to wear an item of clothing, but don’t want to have to take it off and carry it when the weather changes. This product caught our attention because it has a strong, real-world, functional application. We could see this type of garment mass produced and sold to a wide market once the technology and manufacturing worlds support it. 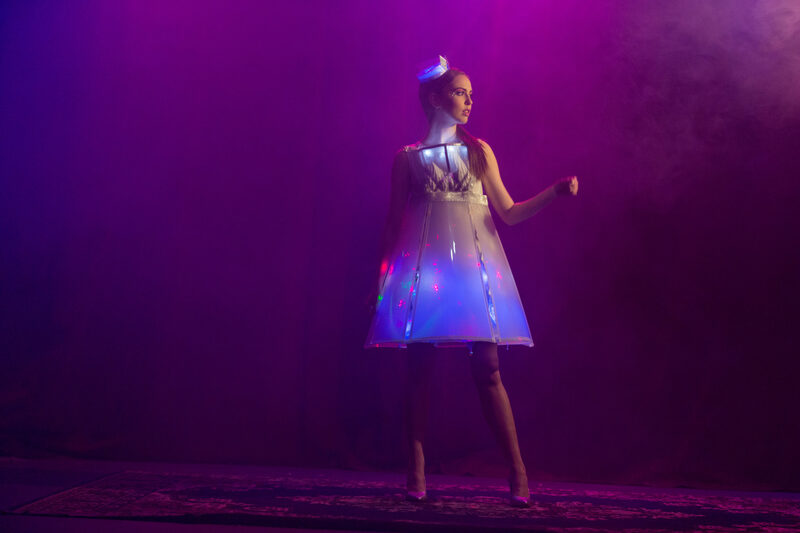 The Little Dada duo is from Toronto, Ontario, Canada and have created a drone dress. You read that correctly, a dress that uses drones. RE: Familiar explores the use of drones as a high fashion object, relating them to witch’s familiars (a creature or spirit who is a spy and a companion to a witch). The dress contains both lighting and fans to move the fabric around. The drone (familiar) follows the model and manipulates the train of the dress, surrounding them with billowing silk chiffon which is propelled upwards. The AR Parrot drones are controlled by custom software designed for the runway, and the garment design itself is inspired by neatly arranged cables within a server room. 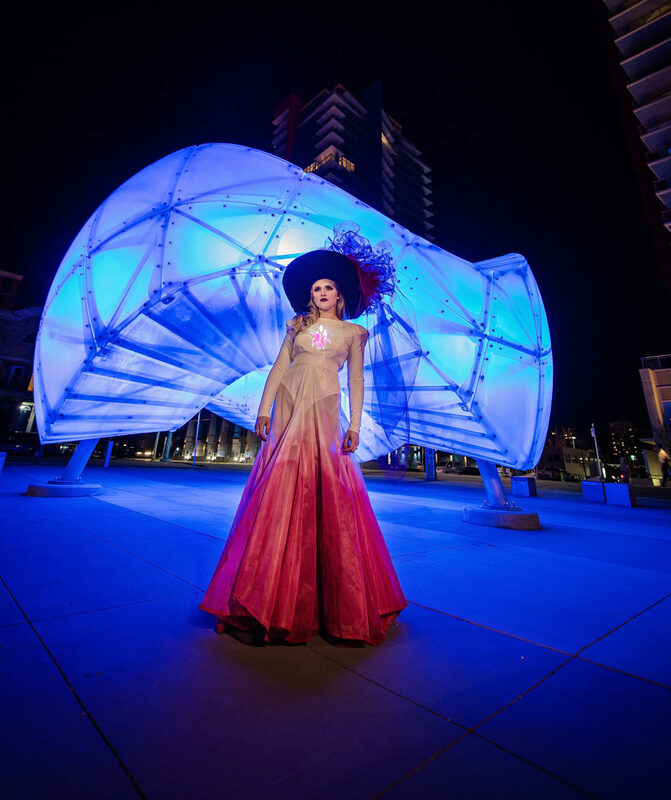 The drone dress showcases a collision of popular technology with fashion that pushes limits and can inspire others to try something unique and difficult. Re:Familiar. Photographer: Edward Ross. Model: Summer. Stylists: Jason Mellor and Ivonne Arsenault. This garment caught our attention because it is hard to ignore a dress that integrates with drones. Drones are becoming incredibly popular, and fashion is not the first thing you think of when you look at a drone. This is a whimsical, fun piece that pushes fashion tech ideas forward in a dramatic way. Erina Kashihara hails from Japan, where she has been producing what she describes as “wearable light art” for over a decade. Her “Double Vision” is a wearable tech garment exploring duality and hidden potential. 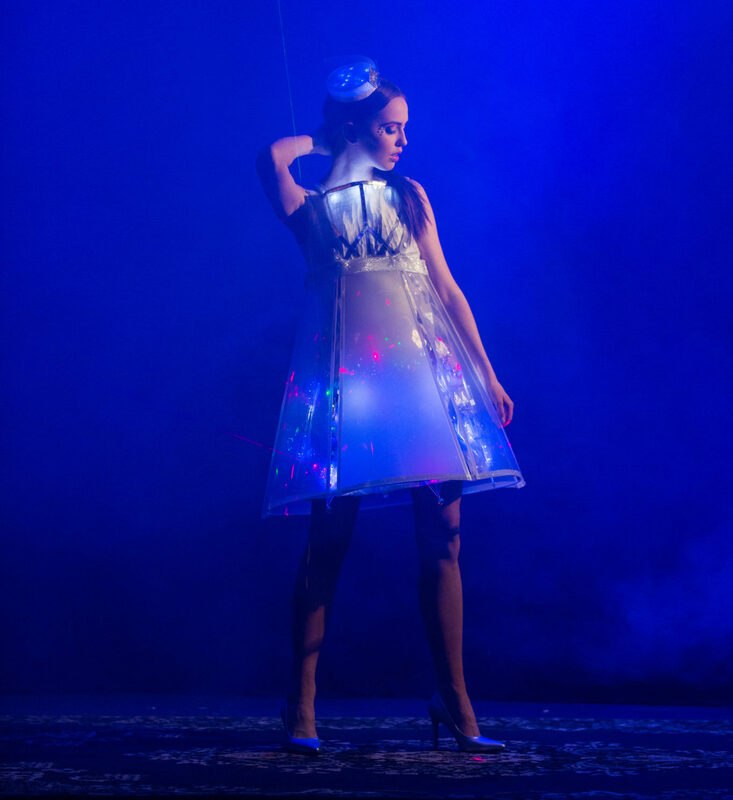 The dress features panels that alternate between transparent and opaque, with lasers and reflecting optical glass beneath them. When the panels are opaque the lasers are obscured, and revealed to the audience when the panels become transparent. This garment caught our eye because it had a stunning visual effect with complex use of technology, but we could also see practical potential. It is designed for a dramatic runway appearance, but we can see future applications for garments that alternate between covering up and revealing the wearer’s body. This combination of fashion and tech could be the answer to the “workwear to eveningwear” single outfit problem. Designers using this technology combination could create one outfit that could change in appearance depending on context. “Lumen Couture 2.0” is an upgraded version of the projector hat first debuted at MakeFashion’s event last year. The original invention by MakeFashion co-founder Chelsea Klukas and Chris Corner hosted a pico projector within a hat that projected images onto fabric on the torso of a model. The new iteration includes a full PC within the hat and a small camera within the brim. The camera tracks a brooch on the model’s shoulder, and uses it as an anchor for the projection. The PC within the hat maps and calibrates in real-time to a mapped model of the wearer, so the model can freely move and tilt her head without the projection shifting. The team also brought on designer Kyle Nylund to design a gown inspired by the projection of blooming flowers. This piece is useful for those who want to stand out with fashion that creates dynamic and unique looks. Lumen Couture. Photographer: Edward Ross. Model: Elizabeth Gray. Stylists: Jade Brunes, Jason Mellor and Ivonne Arsenault. The garment caught our attention not only because Chelsea (the co-author) is the team lead, but because of the potential to leverage the hat’s “Hardwear” for a variety of applications. The video of the dress can be customized, opening the possibility for theatrical, performance and presentation applications. The team is working on the third iteration, which will incorporate augmented reality concepts and an ability for the dress projections to respond to external inputs including sound and motion. MakeFashion co-founder Maria Elena Hoover is lead designer of I(heart), a wearable tech garment designed to raise awareness of the impact of depression and anxiety. The I(heart) design represents the heart chakra (related to love, joy and inner peace) in connection to the solar plexus chakra (related to self-worth, self-confidence and self-esteem). The dress is complemented with a handheld clutch, and they interact with each other. Both the dress and the clutch contain proximity sensors. When the clutch is nearby, the heart and the belt of the dress match color. The interaction is intended to represent external perceptions and influences on mental illness. This product was designed to inspire and raise awareness on mental health issues and how we deal with them as a society. The team plan to incorporate bio sensors in an upcoming release that will help identify anxiety episodes and use lights and color to alert the wearer and help them calm down. I(heart). Photographer: Edward Ross. Model: Jade Buffong. Stylists: Jason Mellor and Ivonne Arsenault. This garment caught our attention because it has a nice design aesthetic with a very important message. Mental health issues have stigma and can be difficult to talk about. A beautiful design that uses technology to catch our eye can be a conversation starter and lead to understanding and mutual support. Furthermore, this garment can help the wearer develop more awareness about their own anxiety and supplement other tools and techniques they use to overcome it. There were other fantastic garments in the show, but these 5 stood out the most to us. MakeFashion continues to provide a space for cutting edge wearable technology design, development and expression. We look forward to seeing what comes out over the next year.